At the GDCF we love sharing exceptional resources created by teachers we work with all over the world. This time around we have something on learning dispositions from Kathleen Baker Brown. Kathleen is the assistant principal at Parap Primary School in Australia's Northern Territory. Deep, authentic, and personalized learning for the success of every child is her motivation as an educator. She's provided us with a shareable resource that is infused with that standard of excellence. "My goal has always been to bring focus to the facilitation of learning, as opposed to the historical focus on 'teaching' of content. Learning happens at school, at home, and out in the world." Kathleen says bridging the gaps between those three places in a child’s life comes from nurturing a mindset of growth, curiosity, and interest. In doing so, schools become environments of exploring and questioning that bring learning and life experiences together. The resource she has created for us reflects that philosophy beautifully. 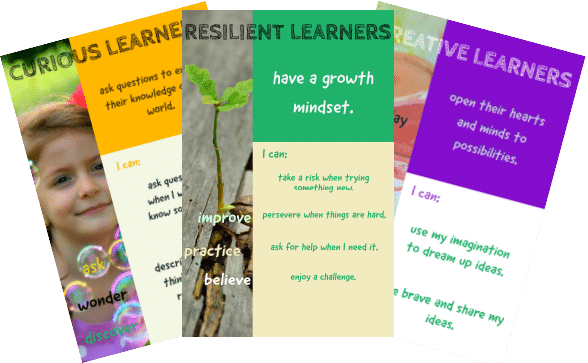 A collection of posters illustrating visible learning is what you get in this terrific resource. Together they make up 5 learning dispositions that bring the Essential Fluencies and the General Capabilities together. Students can use, understand, and benefit from the clear language each poster is presented in, as we all can. Here's how Kathleen and the teachers at Parap Primary worked together to make it all happen. Kathleen's visible learning team began working with teachers on learning dispositions in 2015 as part of a whole-school journey. They examined lists of dispositions in order to identify the top 6 that resonated with them most. The idea was to pick the ones they believed were most important for students to cultivate. "There were clear trends in the data we collected. As an executive team, we identified a number of learner dispositions that captured the beliefs and judgements of our teachers," recalls Kathleen. With the help of GDCF president Lee Watanabe-Crockett, Parap Primary School later began reimagining their learning environments. They started with Solution Fluency and moved into Information Fluency. All the while, teachers were encouraged to loosen their grip on the curriculum and focus more on the skills of the Essential Fluencies. To Kathleen, these were capabilities their learners needed to develop as citizens of the ever-changing digital world. But even so, something was missing from the formula. Though Parap's teachers were willing to learn new approaches, their inquiries always came back to visible learning. A tool offering clear connections between VL, the Fluencies, capabilities, and curriculum was what was needed. Thus, the idea for the learning dispositions posters took flight. 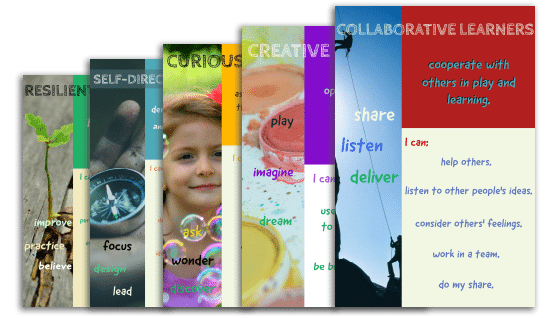 "I knew it was time to give (our teachers) some practical tools to help them guide learners beyond the AC's content descriptions," Kathleen recalls. "Lee and I had conversations with staff about evidence statements and we knew this was where we needed to go." Kathleen set to work with Kim Morgan, Assistant Principal for the Early Years, to develop a set of evidence statements that would be the success criteria for the dispositions they had settled on before. They used the Fluency Rubrics from Mindful Assessment in conjunction with the Australian Curriculum/General Capabilities continuum. Just how well these two sets of documents aligned amazed and delighted them. Ultimately they realized the resource they were designing would enable their students to become visible learners. It would lead them to taking charge of their learning by understanding where they were and where they needed to go. With Principal Yvonne Harding's endorsement and crucial feedback provided by Parap Primary's teachers, they finally had a list of refined statements to use. These would become the posters we are pleased to be sharing with you below. Kathleen enjoyed taking on the creative challenge of bringing her resource on learning dispositions to her teaching community, and now ours. "I've enjoyed getting creative to design the posters, choosing the images that would represent the core disposition of each poster," she says. "I used free stock images from Pexels and Pixabay. I would highly recommend either source for beautiful photographs, easily accessible to schools." In addition, Kathleen hopes this resource will bring wider attention to the Fluencies as a common language in classrooms. Not just in Parap Primary School, but everywhere. "I wanted to ensure the language and pedagogy of the Essential Fluencies was permeating through classrooms. I want them to become a culture and language of learning that we use as learners together all the time." We sincerely hope you enjoy this great resource. Thanks to Kathleen Brown for her wonderful contribution to the modern learning community! Kathleen is the assistant principal at Parap Primary School in Australia's Northern Territory, and has been a passionate learner since the day she was born. She has worked at Parap Primary School for 7 years, and as AP for 4 of those. She places importance on relationships, making real connections, and finding answers to real life questions by making connections beyond school boundaries.